I am running away this week. I will (try) to bury my feet in the sand and screw my head back on. Sometimes life just moves too fast around me and if I try to keep up... well, what's the point? I figured I'd pack today and then try to relax, play some wii with my husband then take off tomorrow morning. But the cat's in the cradle, the kids have the flu... there's an important retailer's meeting tomorrow morning (early!!) and I got an email, last second, telling me that I had not gotten an email that had told me my illustration was unacceptable and I need to redo it. What would you do? I think I know what my friend Jen would do. Well, maybe not. She is rather responsible at times. Needless to say, I want to runaway NOW and not come back. And now I remember WHY I stopped doing free-lance. I guess I'm not very good at reading peoples' minds and my email server is out to get me in trouble. When I get back I will back-track and write about the Spring Into Warner event and my Open Studio and the Gnu Preview party and I'll post the pictures and I'll set up some new classes and I'll learn some French and clean out my closet... OK? Bye. 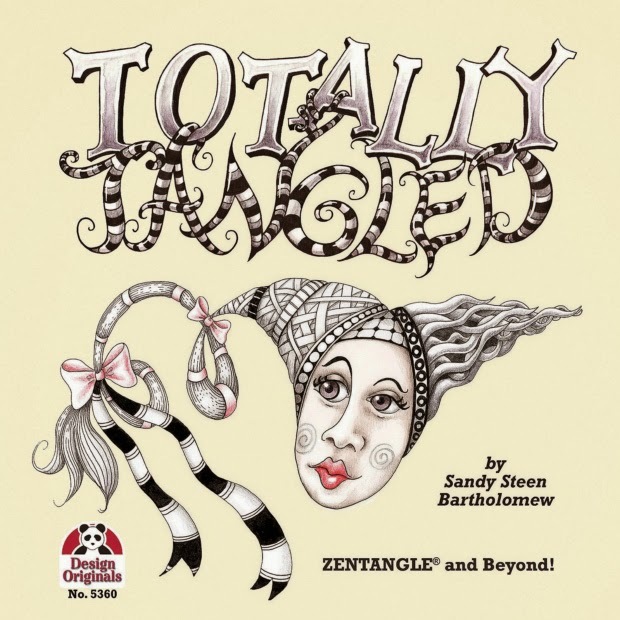 OK, Here's one of my own tangles! I created this one while working on the journal challenge. I have always used stripey... things in my drawings, but this one has sprouted tendrils that I love. You can just keep adding more and more and more! 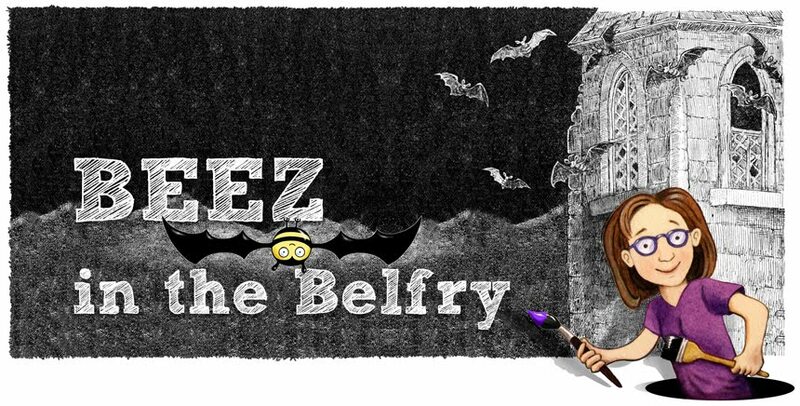 Just be careful not to say the name three times fast or who knows what will happen!? The WCANH group has just begun a new "challenge". This one is a round robin of Moleskine accordian journals and Zentangles. Should be a lot of fun. For mine, I divided it up as four pages with a frame and a wavy "string" going across every page. The fifth page is to try and tie each artist's pages to the next ones. I'm asking each artist to try and incorporate some letters and/or words into their tangles. In this one I put an Escher quote and the words "Art Child". I was inspired by a birth and a death this week. Rick and Maria - the founders of Zentangle, have a new grandbaby - that's the birth. 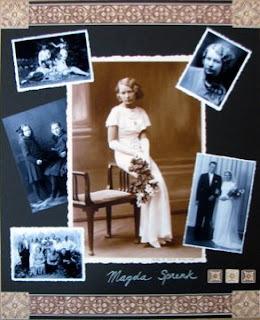 And the death - my grandmother died on Monday. So the quote applies to them and to me as well. Art kids all. I probably don't need to say that this week... sucked. The memorial service is next week, so I imagine next week may be tough too. Except, I intend to run away for a few days to Maine and stick my head in the sand. That should help alot. 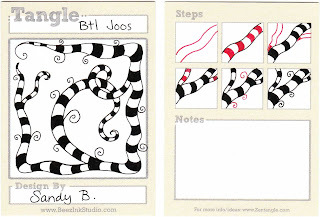 BUT, back to tangles, working on this zentangle was very soothing. I thought about babies and my grandmother and artsy people and things I want to do and accomplish before I die. Maybe this image is very complex and chaotic, but to me, it is orderly and multi-layered. I decided that, yes, there is an awful lot to do. The list never seems to end. But that is a good thing... because it does end, and not always when you die. Perhaps the secret of life is finding a way to time it perfectly! Imagine dying the very day you finish everything on all your lists. Last item: take a nap. I've been thinking so much about my Grandmother and her life and I finally think I know why I feel so sad. I think it's because she completed her list and just existed for these last few years with no goals, purpose, desires... nothing. That's a living purgatory. Whenever I have had to take anti-depressants, it's been like that. Flat, gray, nothing. I would rather scream, cry and do stupid things. Because there is always the possibility of things improving. But when you are in purgatory, you can't even see dying as a goal. No purpose at all. Nothingness. uhhh...shiver. The thought is so claustrophobic it makes me queasy. So now I know. My sadness is my own fear of having no purpose. I learned this by zentangling. Interesting. 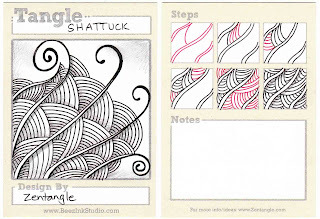 Shattuck is one of my most favorite tangles. There is so much flexibility. I like to draw it as a more organic, plant-like shape, but if you do it flatter and straighter, it looks more basket-woven-ish. If you "mess-up" the back and forth weaving pattern, it still looks cool! And try having your rainbow arcs meet in the center, instead of near the veins, and you get an amazing braided pattern. Yes, Knightsbridge is a "basic" pattern, but it has unlimited customizing options. Also, this simple grid is the basis for many advanced patterns. Once you master the straight on grid, you can wiggle the lines and really distort things. A tip I learned for coloring in checkerboard squares, is to always color the square that is touching the corner of the one you just colored. If you jump around "black, then white, then black..." as soon as you hit an object that is in front of the checkerboard, you can get confused. By going corner to corner, you circle the object and fill in more reliably. Of course, if you do "mess up"... just go with it and do random squares filled-in. That makes a cool pattern like an old tiled floor. Try it on purpose! To get the "bubble" effect as shown above, draw the circle first, then the checkerboard lines around it. The checkerboard IN the circle should be drawn larger, as if it is being magnified. It's very cool - practice! 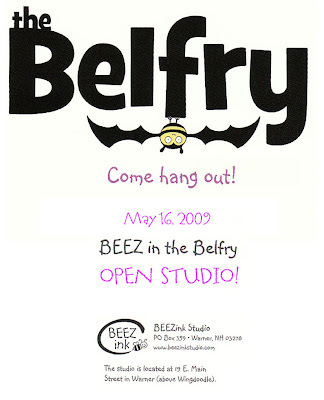 Open Studio on May 16th from 10am to 1pm. 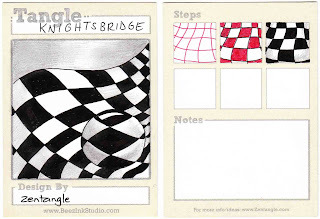 ask me questions about Zentangle! 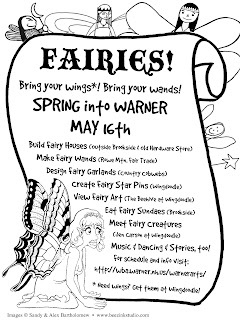 And take part in "Spring Into Warner", too. In honor of Spring, finally, showing up in NH. Here is a tangle with growing things. I didn't like this pattern when I first tried it. I kept seeing the shapes as "ping pong paddles" and had trouble drawing them. When I shifted my perception to see them as "berries"... wow! that's cool! If you like drawing them as "paddles" you can actually get some interesting pine cone effects or even fish scales. 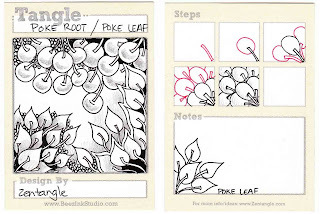 If you are really having trouble with it, try perfecting "poke leaf" first. And be sure to try it with an aura around the final layer!